We've had a few threads pop up lately on Faith and Death. It reminded me a movie I saw a few years back called, "The Seventh Seal". It's an old Swedish film (1957), that asks a lot of very thought provoking questions concerning Death and Faith, although provides no answers. It's $4 to rent on Amazon... although the copyright laws at the time of its making would've put in public domain in 2014 (if Disney hadn't gone in and ruined everything in 1976 (and in Dec 2017)). A knight returns from fighting in the crusades with his squire. The knight has seen and done terrible things in the holy land, and has had his faith shaken. He returns to find Sweden being ravaged by the plague, and it further instills his doubts. His squire, on the other hand, has become a pragmatic atheist. Death shows up, and tells the knight his time as come. The knight challenges Death to a game of chess for his soul. 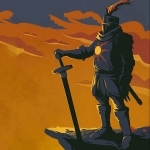 As everyone knows, death always wins in the end, but the knight hopes to forestall death until he can come to terms with his faith, and somehow redeem himself for all the wrong he has done. He wants to die a good man. On their journey, they meet an actor/juggler, who is a man of simple faith. He has visions of God and angels and the virgin Mary. He admits to having lied in the past, but he only did it so people would believe him (much like the LDS Church, I think). He is a good family man, but had had his share of hardships. What I like about this movie, is how much I can relate to the knight. On the one side, there is nihilistic atheism. On the other, pure faith. I am the soul struggling in between. If you get the chance to see it, I would love to hear what you thought. I have seen this film a few times. The chess scene has been sent up many times most notably in Bill & Ted where they play Twister and Battleship with Death.